Boat rental for a Bareboat on the Antonius is possible for up to 25 persons. This ship sails here: Amsterdam, The IJ, Harlingen, IJsselmeer, IJmeer / Pampus, the Markermeer, Vecht, Waddenzee. The homeport of this ship is Muiden. 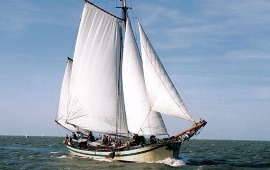 Boat rental for a Bareboat on the Arthur van Schendel is possible for up to 29 persons. This ship sails here: Amsterdam, The IJ, IJsselmeer, IJmeer / Pampus, the Markermeer, Waddenzee. The homeport of this ship is Monnickendam. 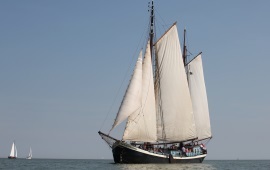 Boat rental for a Bareboat on the Gulden Belofte is possible for up to 37 persons. This ship sails here: Amsterdam, The IJ, Harlingen, IJsselmeer, IJmeer / Pampus, Frisian lakes, the Markermeer, Vecht, Waddenzee. The homeport of this ship is Amsterdam. Boat rental for a Bareboat on the Sybaris is possible for up to 45 persons. 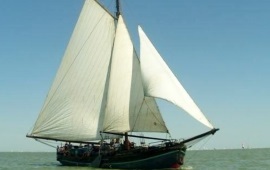 This ship sails here: Amsterdam, The IJ, Harlingen, IJsselmeer, IJmeer / Pampus, Frisian lakes, the Markermeer, Waddenzee. 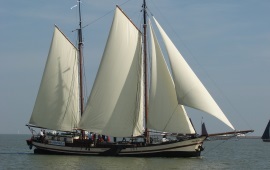 The homeport of this ship is Enkhuizen.